New display technologies have a chicken and egg problem – there’s no content for them, because there are no such cameras (because there’s no displays to watch stuff on). It happened to 3D and it may happen to VR – Virtual Reality – unless products like Samsung’s Project Beyond become popular. 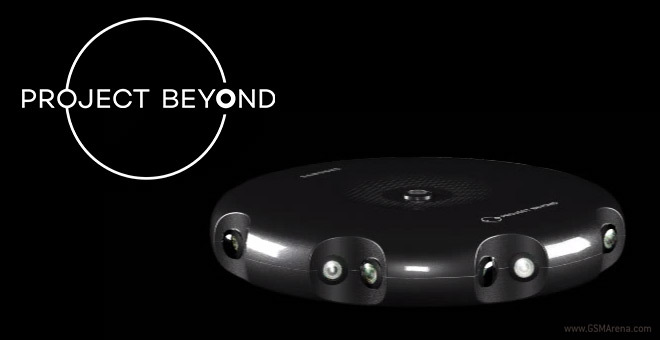 Project Beyond shoots 360° 3D panoramic photos and videos, which can then be viewed on the Samsung Gear VR headset. The Samsung Beyond features a whopping 17 FullHD cameras – 8 pairs capture 45° slices, plus there’s a camera facing up. The camera can capture photos and videos or stream live video, all in stereoscopic 3D. The hardware isn’t ready yet but Samsung has taken a prototype around the San Francisco Bay area and will be adding more locations soon. Gear VR owners will be able to explore those, even if they can’t buy the actual Project Beyond device just yet. Speaking of, the Gear VR is headed to the US for $200.